All or Nothing: Manchester City premiered today exclusively on Amazon Prime Video – all eight episodes are now available in English for Prime members globally, with local language versions coming September 14. 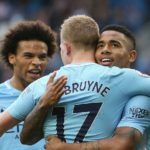 Narrated by Sir Ben Kingsley, the series takes viewers on an exclusive journey through Manchester City’s entire 2017-18 season; from the world-leading training facilities at the City Football Academy, to interviews with the manager, to boardroom meetings and other surprise moments across the season. It includes interviews and dressing room action with legendary coach Pep Guardiola as well as weekly stories that unfold within the lives of the players. Please see the official trailer here.